I have a brand new 2019 Compass. Sometimes when I start it (push button on dash; foot on brake) it only switches “ON” instead of to “RUN”, and then it won’t let me turn it off or start it. We’ve tried a new key fob, and I haven’t figured out any pattern for when it happens (one time first thing in the morning, one time at lunch, one time at gas station). The dealership has had no luck figuring it out. Does anyone have any ideas? I’m worried that I’ve got a lemon (they’ve already had to replace a door latch for me because the alarm went off at random times, and the blindspot warning has been “temporarily unavailable” once too). I’ve had jeeps before and loved them; I’m so frustrated with this one, and would be grateful for any suggestions. - One time it got the end of its 15 minute warmup time, and then let me switch to run. - One time nothing helped for about 5 minutes, so it just stayed in “on”, and then it let me start it. This is going to sound kind of stupid but check the owner's manual. I had a problem with mine locking me out from starting and the radio would be on and the lights would be on but I could not start the car. One day while sitting in the car trying to figure out why I couldn't started it, I looked in the owner's manual, and found a fix in there. to be honest I don't recall where I found it and I don't have the owner's manual with me right now to look it up but I can assure you that I found the problem in the owner's manual and as soon as I follow those instructions the car started immediately. Last edited by 10-64; 03-26-2019 at 01:41 AM. I had the same thing happen to me today and 3 times before that. There seems to be no rhyme or reason to why it does this. The only way I can correct it, is if I open and close the door. This seems to ”reset” the prompt to start the car. The same problem has happened to me many times. 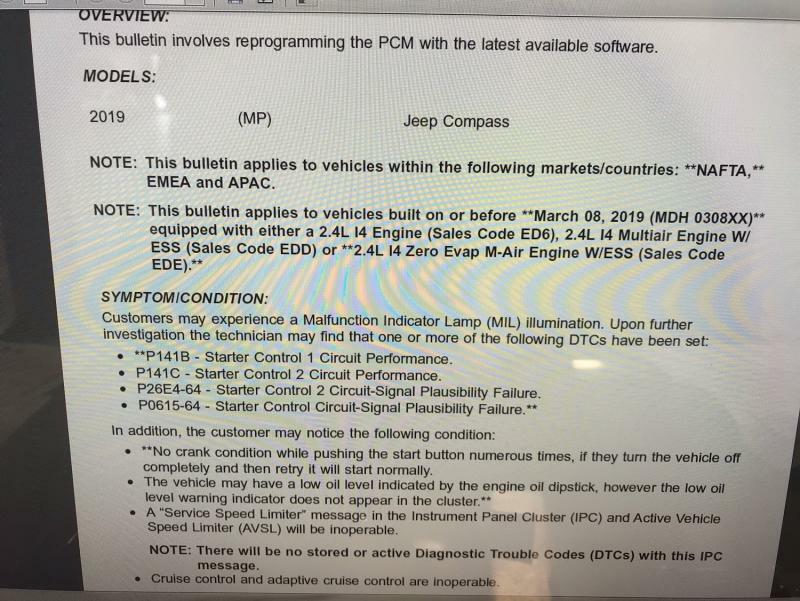 Compass Trailhawk 2019 for Russia (no Start-stop system). If the problem occurs I shut down my car and start it once again. The second start always actually start engine but it is annoying. Yes.. Just found this website and registered so i can talk about this. Same exact thing is happening to me. Just bought a 2019 jeep compass. On more than a dozen times, when i get in the car the break is stiff and I cant start the car. The car acts like it is on but never starts up. I've been on the phone with Chrysler all week about this. They are aware of the problem, and have a software update that is due out in April to fix the problem. I really hope this works because with the amount of time I've waited for my brand new car to start..... No one else has found any other fixes for this correct? They haven’t figured mine out yet — I have an appointment for it to go in again on Monday, and they’ve told me they might just have to wait for the software update, but they want to check some of the other systems too. One thing I’ve discovered is that, when this happens, if I turn it off (press the ignition button with my foot OFF the break) I can then turn it right back on (press the ignition button with my foot ON the break) and then it runs just fine — meaning this is really annoying, but not as disruptive as it first was (when I couldn’t get it to go back off and would get stranded). But yes, this has happened to me at least a dozen times so far, under all conditions (cold engine, quick stop for gas, after a long drive, etc). Have you talked to Chrysler about the problem? Try pressing the "Run/Start" button when it's in this condition. When it’s running (or, it thinks it is running) and you can’t get it off, try hitting the start button with your foot off the brake, and also try it with your foot on the brake. I’ve had good luck when my foot is off the brake, but I guess it depends whether it thinks it is running or not. Mine is in the shop today and they’re contacting Chrysler. I think pressing the start/stop button with the back of your FOB is a hard "shutdown" command. There is a section on the user manual for this. Foot off the brake, press the start button. Having the same issue with a 2017 Compass Latitude. Just when I think I have the combination of steps figured out to avoid the push button start not actually starting, it fails at starting. I would love to know the work around. The dealership I spoke with was only able to offer that I buy a new Jeep. Not helpful. Iâ€™ve now been stuck for over an hour trying to start the vehicle with no luck. Usually I can walk around the block and come back and start it right away or sit for about 10 minutes and then try and itâ€™ll start. Not this time. Iâ€ ve now been stuck for over an hour trying to start the vehicle with no luck. Usually I can walk around the block and come back and start it right away or sit for about 10 minutes and then try and itâ€ ll start. Not this time. 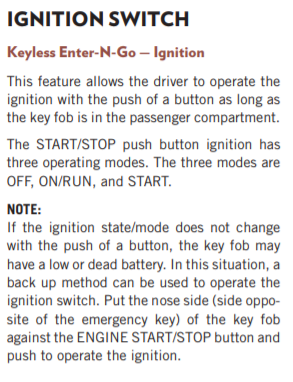 Pressing the FOB key to the start button is a backup mechanisms in case something is wrong with the keyless ignitions system or the computer freezes. It is described on the page 15 of the manual. Good news — there’s a software update out (dated March 20th) that should fix the no-start problem. My dealer ran it for me today. Fingers crossed! really?? Chrysler told me not until the end of April for the software update. Let me know how it goes please! Also thanks for the tips everyone. Next time it happens I will try shutting it off with my FOB. I've been having the same issue with my 2019 Compass, in addition to the brakes occasionally screeching like there's a banshee under my wheel. Today I noticed that the electronic throttle control light came on when it wouldn't start. The dealership I've been taking it to thus far has been unable to duplicate the issue even after having it for a couple of days, which is strange because it happens to me almost every day and the brakes screech every time I drive it, although both issues are intermittent. I even have pictures and a video of it not starting properly, but that doesn't seem to be of any help to the dealership service department. Update: Called FCA to see what my options are. The rep just told me to take it back to the dealership and let them diagnose the issue, even though I told the rep that I've already brought it in twice and the dealership has been unable to resolve the issue and told me they would just have to wait to see if an update came through. Seems like I'm just going in circles. I’m going to have to ask about this software update. I thought I had it figured out as a timing thing. I would get in, not touch the brake, buckle up, then with my finger ready press in the break with my food and immediately follow with pressing start. This was great and worked for 2 weeks with no issues. Well, it didn’t work now and so I’m back on the forum. I’m interested to know if the software update has fixed the issue for anyone, yet? Is there the Number of TSB which I can tell my dealer?